The demand for business to be more agile to meet customer demands and stay competitive is driving a change in the way applications are developed, deployed, and adopted. The challenge has become balancing the agility needs of the business with improving the security of the applications and more importantly the data as it moves between the various clouds. Gaining visibility and preventing attacks that are attempting to get access to the data both from an external location and through a lateral attack becomes imperative in all locations the applications and data reside without adding additional complexity or cost. 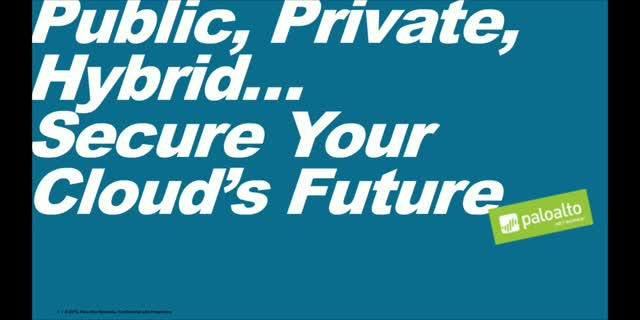 Organizations require visibility, control, and prevention capabilities across all major private and public cloud environments enabling consistent security policies and protection no matter where it is deployed. •Visibility: Consistent visibility across clouds is one of the most common issues with multi-cloud deployments. •Threat prevention: Block known and unknown threats is a critical requirement to protect applications and data no matter where they reside. •Automation: The ability to natively integrate into a variety of environments to match the dynamic and on demand nature of cloud services. •Centralized management: Manage your virtualized and physical firewalls from a single management console, delivering consistent policy and features across all clouds.